If you have any questions in the meantime, please contact Mr. Raphael KOLLER from the Austrian Fire Brigade Association (raphael.koller@feuerwehr.or.at). Further please send him a short message in case of participation until January 12 th, 2018. Ten nation participated in the workshop based meeting. The participants presented their preparations for terrorist attacks. Mr. GRÄFLING (Fire chief of Berlin) summed up the car-ramming attack from December 2016 at Breitscheidplatz. Also, the working-time-directive and the situation of Finnish voluntary fire brigades were discussed. The 5 th meeting of the CTIF Working Group “voluntary fire service” will take place in France. If you have any questions in the meantime, please contact Mr. Raphael KOLLER from the Austrian Fire Brigade Association (koller@bundesfeuerwehrverband.at). Further please send him a short message in case of participation until January 20 th 2017. 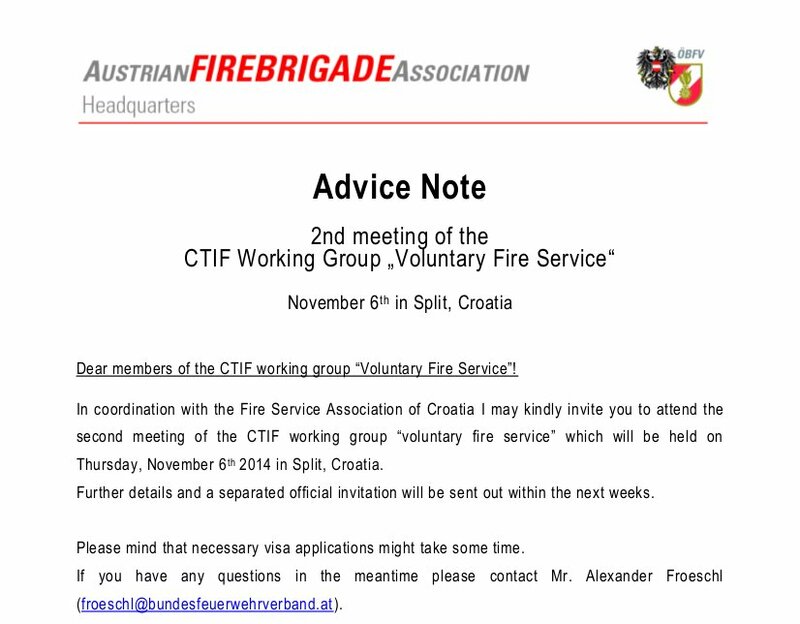 In coordination with the Fire Service Association of Croatia I may kindly invite you to attend the second meeting of the CTIF working group “voluntary fire service” which will be held on Thursday, November 6 th 2014 in Split, Croatia. Further details and a separated official invitation will be s ent out within the next weeks. Please mind that necessary visa applications might take some time. If you have any questions in the meantime please contact Mr. Alexander Froeschl (froeschl@bundesfeuerwehrverband.at). 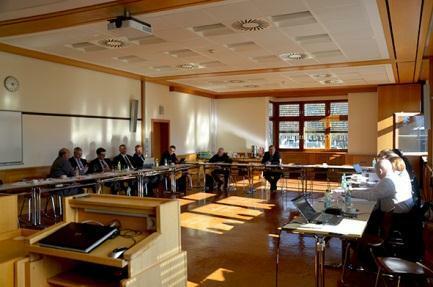 The first meeting of the CTIF working group „voluntary fire brigades“ was held in Salzburg, on February 14th 2014. The CTIF working group is seen as a communication platform for the participating countries to articu late necessary framework conditions for voluntary fire services. Though voluntary fire service systems across Europe and beyond have a wide range of characteristics common interests and needs still appear – such as lobbying, the legal and economic framework of voluntary firemen or the sustainable development of youth fire services. The participating states agreed as future working programme on developing a document (“resolution”) to pronounce common stances of voluntary CTIF fire services. 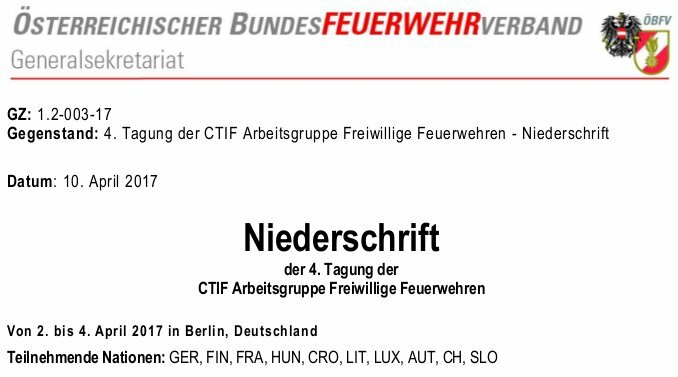 The next CTIF meeting “voluntary fire services” will be held in Split, Croatia in November 2014.
on behalf of CTIF Vice-President Fire Chief Hubert Vetter I may forward the invitation and the agenda of the first meeting of the CTIF working group „voluntary fire service“ which will take place in the City of Salzburg, Austria from February 13th to February 15th. In case of participation please book your hotel room until February 1st (please see the attached invitation for further details) and confirm your attendance with a short message to froeschl@bundesfeuerwehrverband.at (Austrian Fire Brigade Association). If you have any questions or inquiries please feel free to contact me any time!